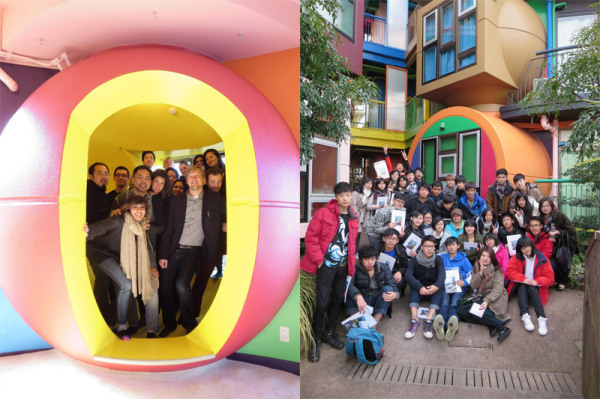 To experience the Reversible Destiny Lofts Mitaka, we provide public/private architectural tours in Japanese and English with reservations. We have received more than 10,000 visitors in total from more than 20 countries*, and this architecture/art work has been featured in various print media and films. Our public tours are held on fixed dates* and in Japanese only, but we will be pleased to meet your request for a private tour in English. Please contact us at least a week before your preferred date. Generally, private tours are available from 10 people minimum (up to 30, approximately), and if you have any questions about the number of people, please feel free to ask us. A tour takes ninety minutes, and is fully guided by staff members of ARAKAWA+GINS Tokyo office. You will have the opportunity to take photos and visit two rooms and the exterior where there usually is no admittance except for residents. Tours with workshops navigated by specialists* are also available. We also are able to customize your own architectural tour program. We have been providing special tours for private companies, educational institutions (from kindergarten to graduate students), and tourists from overseas. Please contact us for further information by phone (0422-26-4966) or E-mail (info@rdloftsmitaka.com). The Reversible Destiny Lofts Mitaka makes your body become an “architectural body” (ARAKAWA + GINS). This tour is specially organized for those who would like to experience the lofts perceiving the space through your body. A workshop leader will guide you in releasing your body into the space, and you may enjoy walking blindfolded with other participants. As this program is focused mainly on bodies, we will give you just the minimum information on the architecture and authors, ARAKAWA+GINS by words. + The duration of a tour is one hour and a half (90min) in general. + Admission is 32,400 Yen per group (up to 10 people, except interpreter or tour guide, including pamphlet) + 2,700 Yen per additional person will be charged. + If you choose a tour with workshop, additional 10,000 Yen will be charged as the navigator’s fee.